A Magical Story Of Wisdom And How To Apply It To Your Life. There is a marvelous Shaman tale that has been passed down from generation to generation that truly speaks of the potential magic inside ourselves. It goes something like this. An elderly Cherokee Native American was teaching his grandchildren about life. He said to them, “A fight is going on inside me, it is a terrible fight and it is between two wolves. 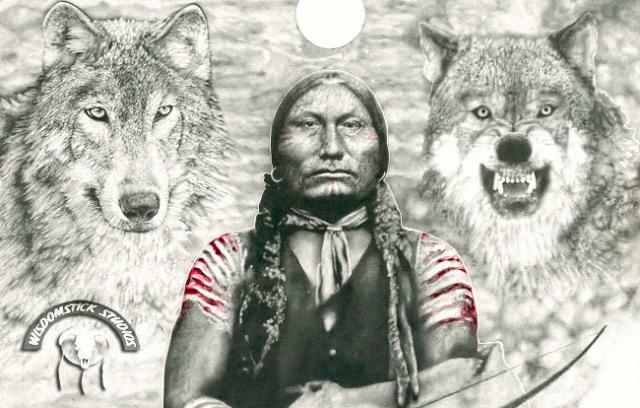 One wolf is evil—he is fear, anger, envy, sorrow, regret, greed, arrogance, self- pity, guilt, resentment, inferiority, lies, false pride, competition, superiority, and ego. The other is good — he is joy, peace, love, hope, sharing, serenity, humility, kindness, benevolence, friendship, empathy, generosity, truth, compassion and faith. I first heard this tale when I was in University and its impact has stayed with me ever since. How simple, true and powerful a lesson this is; we become what we focus on. If we constantly focus on what is good and on our positive qualities, we will eventually take on and pass on those traits. If we let those elements that are negative and destructive take hold, well we all know what will follow. However as simple and true an insight this is, it can be difficult to constantly feed the right wolf all the time. Yes unfortunately life does have a way of forcing us into situations that can negatively impact us and cause us to feed that negativity. We can see this happen in our life, our work and our relationships. The real magic secret here is to “never stop believing and never stop trying”! When we encounter a set back or a negative situation, we need to simply take a step back, take a deep breath, and remember which wolf we need to feed. An approach I use is called “pattern interrupt”, and I practice it all the time. I wear on my wrist a number of elastic bands. Whenever I encounter a negative situation I pull the elastic band and let it snap back onto my wrist. At the same time I think only the positive answer to the situation. For example in your work if the thought or feeling comes up that something “cannot be done”, when you snap your wrist make the thought inside your mind “nothing is impossible – there is an answer”. You can use this approach in every situation in life and in business; it simply is a matter of following through and coming up with the right positive response. Technically what is happening is the snapping is shocking your system to take the focus off of the negative, and the implant of the positive thought affects your conscious mind (current mental state) and subconscious mind (which over time will affect how you feel and look at things). I personally have used this approach to break habits, solve problems and constantly empower my mental state. Try it, it really does work. Right now put a couple of elastics on your wrist. Now for the next ten days whenever a negative situation occurs or negative thought pops into your mind snap the elastic band on your wrist and think the mantra “I am a good person – I am deserving – nothing is impossible – there is an answer”. Or come up with something else that might be more applicable to you. But the point is try it. After all what do you have to lose? You may be surprised with the magic that it can create. PS: Now remember you only have to do this for ten days, no longer. After all you wouldn’t want to work this kind of magic any longer, would you:)!